Join us here at Ivy Chapel as we celebrate Holy Week, and mark the journey to Easter. Sunday, April 14 at 10 a.m. for Palm Sunday worship as we celebrate Jesus’ entry into Jerusalem. Thursday, April 19 at 7:30 p.m. for Maundy Thursday, sometimes called Holy Thursday, the night of the Last Supper. Friday, April 20 at 7:30 p.m. for Good Friday worship commemorating the crucifixion of Christ. On Easter Sunday, at 6:30 a.m. we gather for Sunrise Worship to celebrate the resurrection. We gather again at 10 a.m for our Easter worship service. He is Risen! It’s that time of year again – the Ivy Chapel Church Picnic is Sunday, June 3 immediately following worship. Weather permitting, the picnic will be held in the Eric Moody Memorial Pavilion. Hamburgers, bratwurst, hot dogs and drinks will bee provided. There is a sign-up sheet in the Narthex for other dishes to be brought and shared. Our theme this year is Happy Birthday, so join in the fun as we celebrate the day with games, piñatas and cake and ice cream! Please email if you have questions or ideas for the celebration. Wait, school just got out – why are we talking about collection school supplies already? The special back to school parties hosted by Isaiah 58 and Circle of Concern start earlier than ever and will be held in July!. So just keep those dates in mind so you can watch for bargains and be ready to look for items needed (including kids underwear and socks and backpacks). Specific lists will be available at the beginning of July, but start looking for sales now. Questions? Email us and we’ll fill you in on the details. Join us during Holy Week as we journey with Christians around the world toward the miracle that is Easter. Here at Ivy Chapel United Church of Christ, we are proud of the longstanding relationships we have had with the organizations we support. We’re also proud to announce a newer partnership, with Isaiah 58 Ministries. As you consider how you will support Isaiah 58 Ministries it is helpful to know that because of their partnerships with St. Louis Area Foodbank and Operation Food Search your giving dollars can be stretched. Donations of canned and box foods are always appreciated, but it also good to know that financial contributions are also welcome. As a Tier One partner with the Foodbank, Isaiah 58 is able to purchase food for 10 cents a pound. For example an average box of cereal costs $4.00. If you donate the $4.00 directly to their ministry Isaiah 58 can purchase approximately 40 comparable boxes of cereal through the food bank, allowing them to feed even more families. Visit the Isaiah 58 ministries website to learn more about this organization. If you’d like to contribute through Ivy Chapel, or if you would like to learn more about how we work with Isaiah 58 and other local organizations, please feel free to reach out to us. Ready to escape the cold weather? Join us inside the warm confines of Ivy Chapel for spicy (but not too spicy) chili. It’s one of our biggest fundraisers of the year, but it’s also a great chance to connect with your neighbors and friends. Bring them along, bring the entire family… and have fun! Saturday, Feb. 17 from 4 p.m. to 7 p.m. Questions? Send us email to chili2018@ivychapel.org. 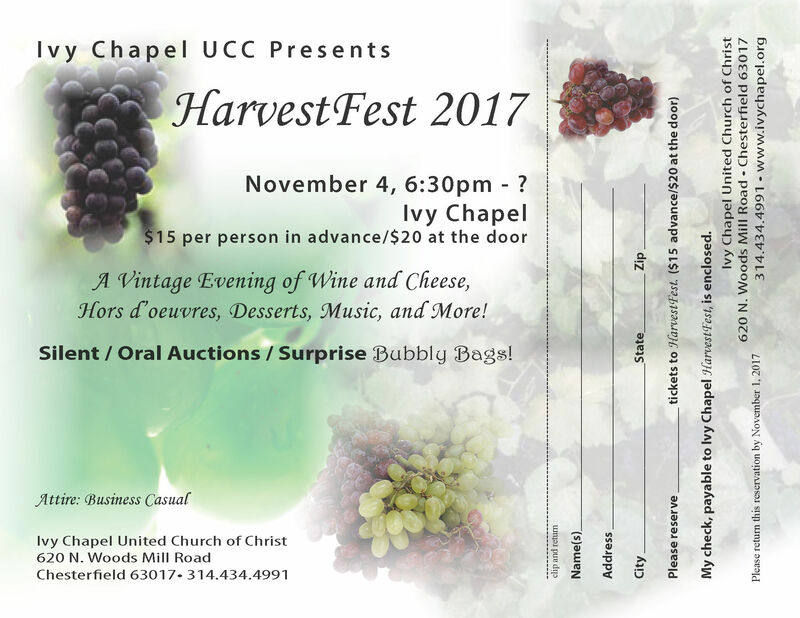 You are invited to a vintage (but that does not mean old and stuffy) evening of wine, cheese, appetizers, desserts, music and more. And oh yeah, did we mention the auction? Silent and oral auctions, secret bubbly bags and other surprises are in store all evening long. Proceeds will benefit Ivy Chapel programs. Looking for a ticket? Have an auction item to donate? Drop us a line or call 314-434-4991 and we’ll set you up. Thank you… and see you there. Want to help promote HarvestFest? Use these flyers and invitations to spread the word.